Some of the books that I read I just have to share with the children I work with and sometime they love them as much as I do. 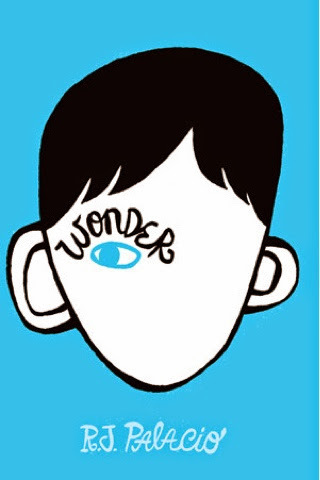 If they've read an entire book with me I encourage them to do a review of that book and so today I have another review of Wonder by one of the children who read the book with me at school. I always publish these review word for word so there's nothing added and nothing left out. Review: this brilliant book called Wonder has many fabulous parts and I will share with you one of my favourites. This is the part when Jack bad-mouthed August. The reason I like this scene is because it is so emotional. You end up feeling very sorry for him-especially when she describes him crying all alone! The author really has the power to make you feel emotion. In this part especially she uses this properly. My favourite character is August. This is because no matter how 'weird' he looks, he still gets on with life. Also, he is very kind and funny. After all, it is not the appearance that matters, it is the personality! A persona could be handsome but rude. Another human could be ugly, but they could be kind. I would rather be friends with the kind humans despite the fact that they were 'deformed'. That is why I like him. I recommend this book to everyone over the age of ten as they need to understand it. It is a very emotional and funny book and I rate it five star! It is destined to be as renowned as Harry Potter!